Jeffery Nelson 9 mm. 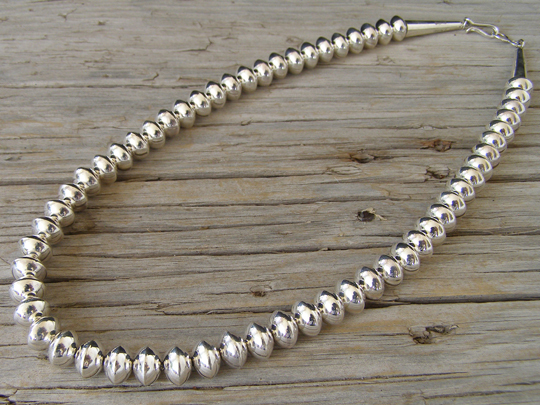 Diameter Handmade Sterling Bead Necklace length 18"
Jeffery Nelso is a Navajo silversmith who specializes in making handmade Sterling beads. Few artists make handmade beads today and Jeffery's are characterized by an ultra high-polish and smoothness which is hard to achieve. This strand of beads consists of beads of uniform diameter finished off with Sterling cones at the catch. This set of beads shows an impeccable polish so common to Jeffery's work. Hallmarked J. Nelson and stamped Sterling on the cones.